Με το τέλος του έτους να πλησιάζει, η εποχή πριν από τα Χριστούγεννα είναι εποχή βραβείων. Ήδη έχουμε δει μερικά όμως δεν είναι ποτέ αρκετά. Έτσι, όπως συνηθίζει κάθε χρονιά, το Ward’s Auto ανακοίνωσε τους νικητές για τους καλύτερους κινητήρες της χρονιάς. Αυτό που προκαλεί εντύπωση πριν προχωρήσουμε στα αναλυτικά αποτελέσματα, είναι η συνεχιζόμενη επιτυχία των υπερτροφοδοτούμενων συνόλων, μιας και οι επτά από τους δέκα κινητήρες που κέρδισαν φέτος είναι τεχνολογίας turbo, με τα άλλα τρία σύνολα να είναι υβριδικά. Επίσης αξίζει να σημειωθεί πως για πρώτη φορά μετά από 23 χρόνια του θεσμού, στην λίστα δεν βρίσκεται κάποιος V8 κινητήρας. Για να προκύψει η λίστα με τους καλύτερους, οι editors του Ward’s Auto αξιολογούν τους κινητήρες στους τομείς της ιπποδύναμης, της ροπής, των τεχνικών χαρακτηριστικών (συγκριτικά), του θορύβου, της οικονομίας καυσίμου και της εφαρμογής νέων τεχνολογιών. Φέτος, οι υποψήφιοι ήταν 40: οι 10 περσινοί νικητές συν τα 30 νέα ή σημαντικά ανανεωμένα σύνολα του 2016, ενώ για να συμπεριληφθεί ένα όχημα, η τιμή του δεν πρέπει να ξεπερνά τα $62.000. For the first time in 23 years of testing, a V-8 fails to earn a spot on the Wards 10 Best Engines list, but many high-output turbocharged 6-cyl. engines are generating enough horsepower and torque to fill the void. Winning automakers will be honored Jan. 11 at a WardsAuto ceremony in Detroit during the North American International Auto Show. Three electrified drivetrains make the Wards 10 Best Engines list for the second time in as many years, while all seven remaining honorees are turbocharged, illustrating the industry trend toward downsized powertrains with forced induction and direct fuel injection. For the first time in 23 years of testing, a V-8 fails to earn a spot on the list, but many of the high-output turbocharged 6-cyl. engines in the competition, even some that didn’t make the cut, generate enough horsepower and torque to fill the void. Two of the honorees are return winners. Since 1995, the competition has recognized outstanding engines and electrified propulsion systems, as well as the technology and engineering behind them. This year’s field of 40 nominees includes all new or significantly improved powertrains, as well as last year’s 10 returning winners. “Automakers see downsizing, turbocharging and electrification as key strategies for delivering no-compromise powertrains that also are fuel efficient, and this year’s list clearly affirms that strategy,” says WardsAuto Senior Content Director Drew Winter. WardsAuto editors evaluated the 40 vehicles in October and November, driving to and from home, work, school, the hardware store and on weekend roadtrips. There is no instrumented testing. Vehicles must have a base price no higher than $62,000 to be eligible. BMW had two stellar 3.0L 6-cyl. turbos in this year’s competition, and it was hard picking just one for the list. The new M2 coupe has a 365-hp version of the N55 engine that won three consecutive trophies starting in 2011. BMW M240i efficient and sporty. 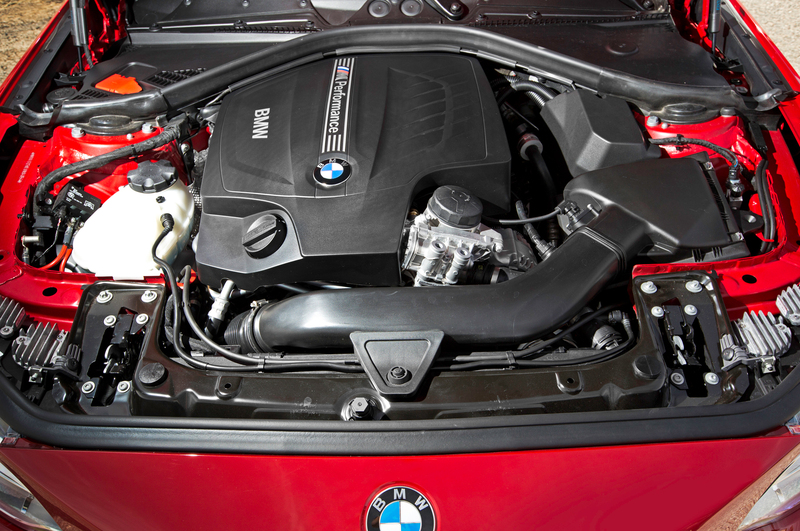 But last year BMW introduced the B58 turbo-6 from a new modular engine family, and it sailed onto the 2016 list. It makes the cut again this year, upgraded from 320 hp to 335 hp in another version of the 2-Series coupe, called the M240i. Judges find this engine slippery fast and incredibly smooth, while consuming less fuel than some of the 4-cyl. turbos we tested. During 12 glorious days of spirited driving, the B58 in the M240i approached 26 mpg (9 L/100 km). The engine makes more torque – 369 lb.-ft. (500 Nm) – than the M2 and can sprint to 60 mph (97 km/h) in 4.4 seconds, just a hair slower than the M2 but faster than last year’s 4.6-second pace with the first B58 I-6 in the 3-Series. 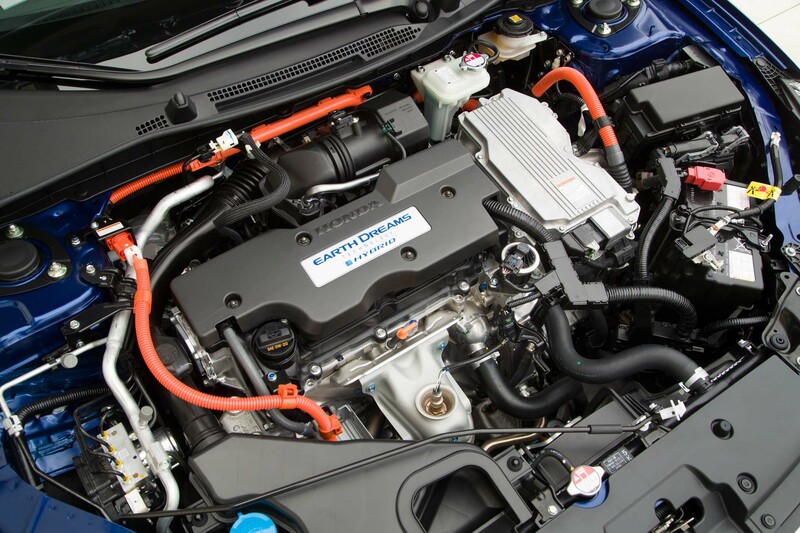 Another returning winner, the Chevrolet Volt, distinguishes itself on several fronts. Of the three plug-ins or hybrids making the cut last year, only the Volt returns to the list. And getting there was tough, as an unprecedented pool of 11 nominees with electric propulsion (seven plug-in hybrids, three hybrids and one battery-electric) were vying for recognition. General Motors’ second-generation Voltec drivetrain remains one of the most innovative and disruptive propulsion systems ever produced. 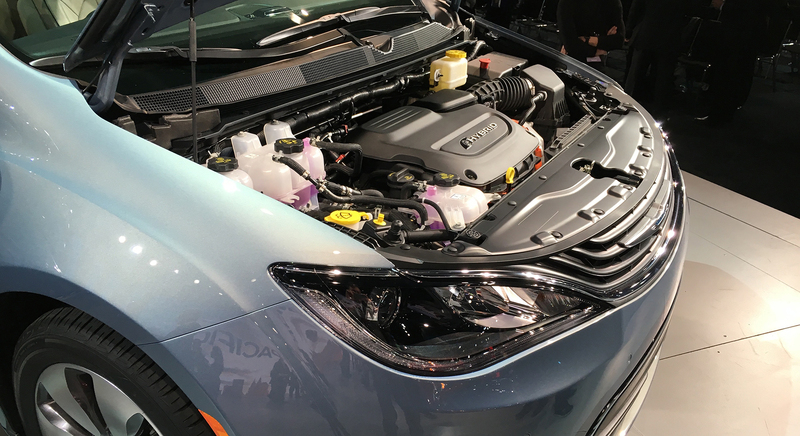 Chrysler adds electrification to its all-new Pacifica to create a segment-first plug-in hybrid minivan, as well as an award-winning formula. Chrysler Pacifica Hybrid at startup. The unique powertrain employs dual electric motors and a heavily revised 3.6L Atkinson-cycle V-6 to achieve up to 33 miles (53 km) of electric range, 566 miles (911 km) of total range and real-world fuel economy observed by our judges topping 30 mpg (7.8 L/100 km). In our estimation, that makes the practical and functional Pacifica Hybrid a game-changer. Fans of the Pacifica Hybrid will be thrilled to know this new eHybrid system is part of a flexible platform that could expand electrification to other FCA front-wheel-drive vehicle programs. 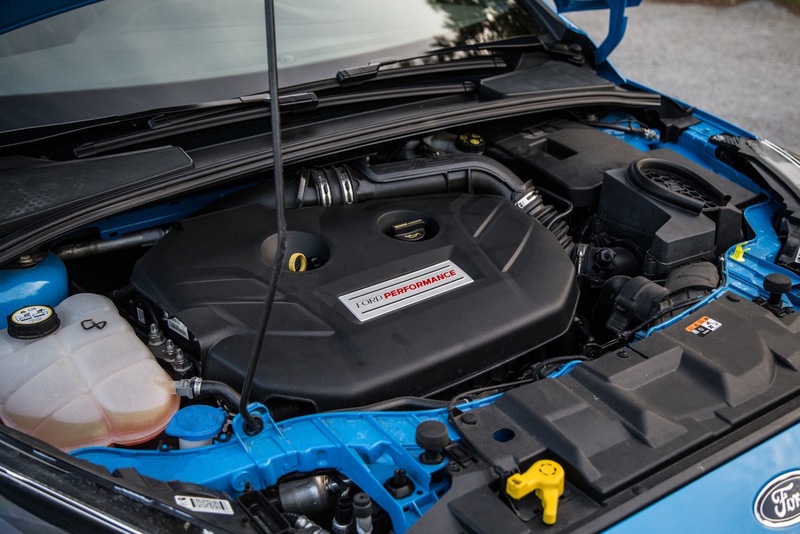 Ford offered up four solid new powertrains for this year’s competition: the 3.0L twin-turbo V-6 in the Lincoln Continental, 3.5L EcoBoost V-6 in Ford F-150, Fusion Energi PHEV and 2.3L turbocharged Focus RS, as well as the 5.2L V-8 in the Shelby GT350 Mustang, a pavement-pounder that won last year and still leaves us slack-jawed. All of them were in the hunt, but it was the high-strung, high-emotion, track-ready Focus RS that makes the cut by virtue of its 350 hp and 350 lb.-ft. (475 Nm) of torque doled out through all four wheels. This 2.3L turbo-4, modified since its first application in the Mustang a few years ago, sends the Focus RS from standstill to lightspeed in a flick of the throttle. There simply are no dead spots in this all-aluminum engine’s power delivery, making the RS a totally civil daily driver. Graphics betray sense of urgency for Ford Focus RS. Of the 40 powertrains tested this year, including many geared for high performance and sporting high-end badging, none was more exhilarating to drive than the Focus RS. And let’s not forget about bang for the buck: All this can be had for less than $37,000. The Honda Accord Hybrid was a slam dunk for the 2017 list, and it was the only conventional hybrid (among three) to make the cut. But this standout powertrain is unconventional in its ability to fool many drivers into thinking they’re not piloting a gas-electric hybrid. This system pairs a 2.0L Atkinson-cycle 4-cyl. with a traction motor for total output of 212 hp. And the traction motor is rated at 232 lb.-ft. (315 Nm) of torque from zero to 2,000 rpm, making it fun – and easy – to launch the Accord Hybrid with gusto. A second, smaller motor functions as a generator, feeding electricity to the traction motor to charge the car’s lithium-ion battery pack. Despite all that energy lurking under the hood, as well as the Accord Hybrid’s new Power mode to dial up the sportiness, some WardsAuto judges achieved 47 mpg (5 L/100 km). Among hybrids, this may be the best balance yet of performance and fuel economy. 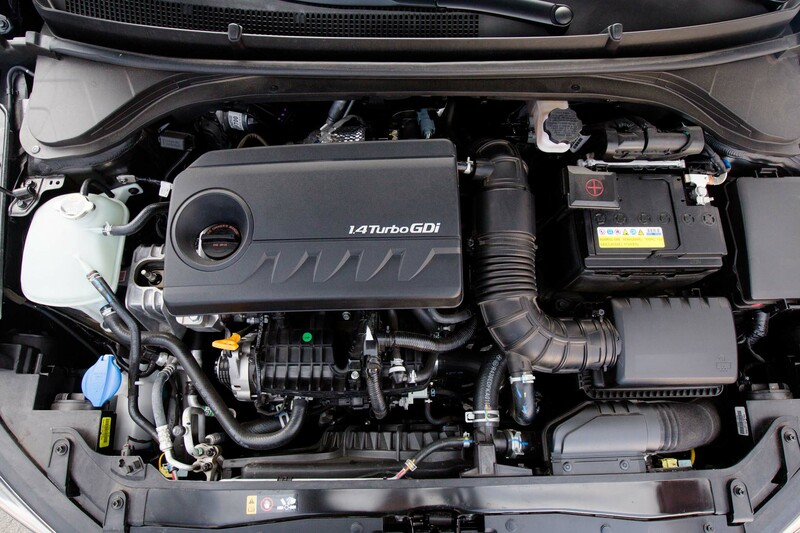 Every year, we hope to find a small gasoline engine in an inexpensive car that delivers refinement, performance and fuel economy uncommon among compacts. This year’s hands-down winner is the Hyundai Elantra Eco’s 1.4L turbocharged and direct-injected Kappa 4-cyl. Out the door well-equipped for $21,610, the Elantra Eco returns great, hybrid-like mileage – up to 40 mpg (5.8 L/100 km), based on our testing. This fuel-sipping goodness comes without compromise: The 1.4L turbo feels more stout than its 128-hp rating, and peak torque arrives quickly – as early as 1,400 rpm and holds steady until 3,700 rpm. The bargain price includes another upscale feature that helps this engine shine: a quick-shifting 7-speed dual-clutch transmission. And the Kappa 1.4L applies several compelling new technologies, such as an exhaust manifold integrated within the head and two thermostats governing separate cooling channels for the head and block. Quiet, exceedingly capable, affordable and fuel efficient – Hyundai’s new pint-sized powerplant checks all our boxes. Infiniti has a new engine that is so good, we are confident it will boost the visibility and image of Nissan’s luxury brand. The Q50 sedan’s spectacular 400-hp 3.0L twin-turbo V-6 puts Infiniti neck-and-neck with its German competitors in the powertrain department. This engine’s mirror-bore cylinder coatings, electrically driven intake-valve timing and integrated exhaust manifolds have us thinking this new “VR” engine family just might be a dynasty in the making. It’s one stealth fighter: Silky smooth, quiet when you want it to be and capable of delivering respectable fuel economy topping 23 mpg (10.2 L/100 km). But step on the gas and be prepared for a wallop that slams you into the seatback. 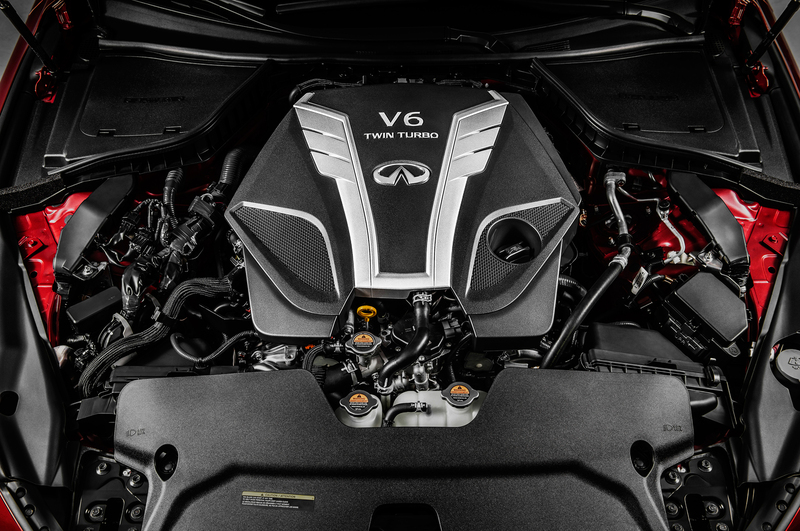 Available in a sporty, content-rich Q50 for just over $50,000 and employing continuously variable valve timing, this intercooled 3.0L VR also comes in a more-efficient 300-hp version of this sedan, and that engine is no slouch, either. Putting a 4-cyl. engine into a 7-passenger CUV doesn’t usually send a thrill up the leg of automotive journalists, but Mazda worked some real magic with the new Skyactiv 2.5L. Direct fuel injection and an ingenious cylinder-head design allowing scavenging of exhaust gases to boost power and efficiency help this engine deliver excellent low and mid-range torque like a big V-6, and it had some of us checking under the hood of the new second-generation CX-9 to make sure it wasn’t. 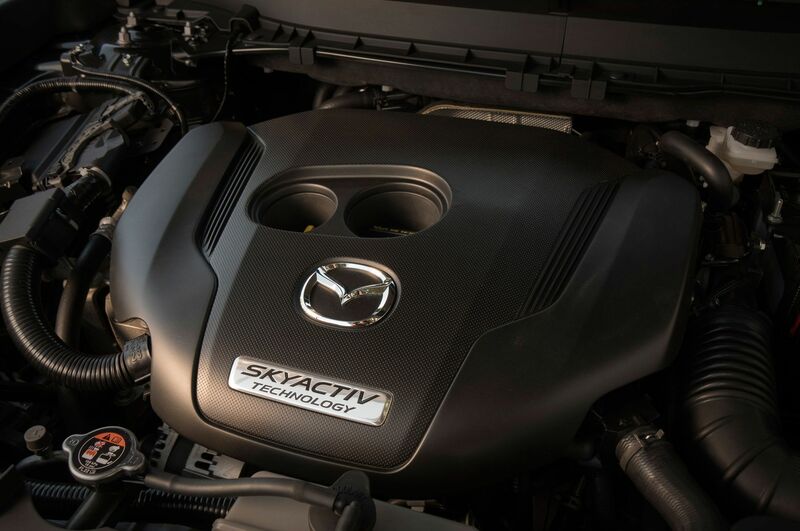 Mazda has built its “zoom-zoom” brand image on new, technically savvy Skyactiv engines over the past several years, but this is the first one applying forced induction. The automaker claims an industry first with its Dynamic Pressure turbocharger, which uses a butterfly valve in the exhaust plumbing to create more pressure at low engine speeds, helping the turbo spool up more quickly and mitigate lag. Mazda advertises two output levels for this 2.5L 4-cyl. – 227 hp with regular unleaded and 250 hp with premium 93-RON fuel, for the driver who occasionally wants a bit more jump. Sport+ mode makes Mercedes C300 even more entertaining. Of the dozen or so small-displacement turbo-4s in this year’s field, the 2.0L in the rear-wheel-drive Mercedes-Benz C300 may have been the most surprising. Its numbers – 241 hp and 273 lb.-ft. (370 Nm) – are respectable enough, but it’s the way that power is delivered that wowed our judges. 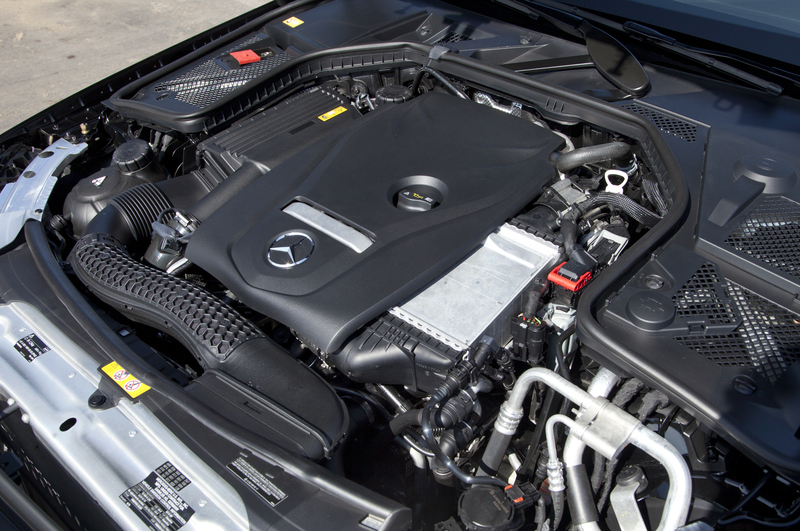 Hitting peak torque at just 1,300 rpm, the direct-injected Mercedes engine pulls hard from launch to redline, all while maintaining a smooth and silky refinement that belies its punchy performance. Add in a solid 26 mpg (9 L/100 km) recorded by our editors – matching the EPA’s combined estimate and topping several other turbocharged 2.0L contenders – and this baby Benz is a winner. This engine (codename M274) first impressed us in mid-2016 in the larger E-Class sedan, and we were surprised to hear it is not entirely new. Instead, it’s an improved version of the M270 2.0L turbo-4 in the smaller 208-hp front-wheel-drive CLA sedan. Upgrades include optimized valve timing, reduced pumping losses and a switch to high-strength aluminum for the head. 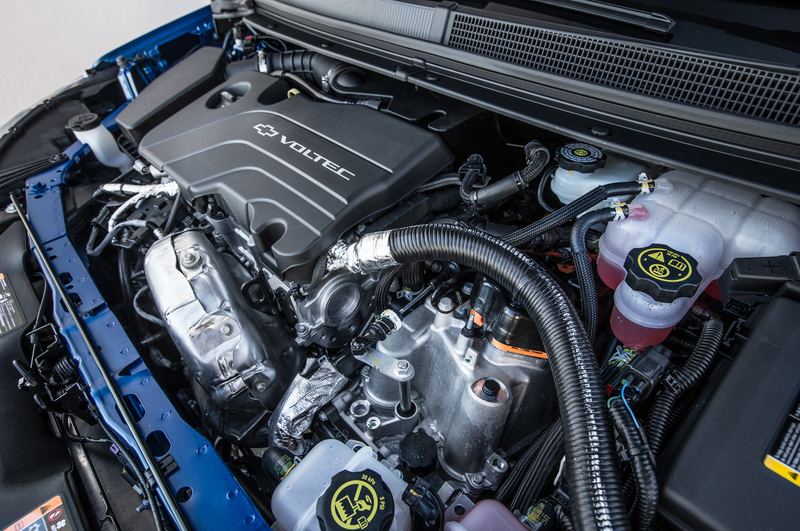 Not long ago, a newly designed engine that could achieve 100 hp per liter was a big deal. Today, many automakers have blown past that mark, but none quite like Volvo, with the 2.0L I-4 in the V60 Polestar. Using both turbocharging and supercharging, this engine makes 362 hp, or 184 hp/L – a threshold never before seen in our competition. A less powerful version of this powerplant, known as the T6, made our list last year in the XC90, when the 2.0L made 316 hp and had no problem moving the 7-passenger XC90. 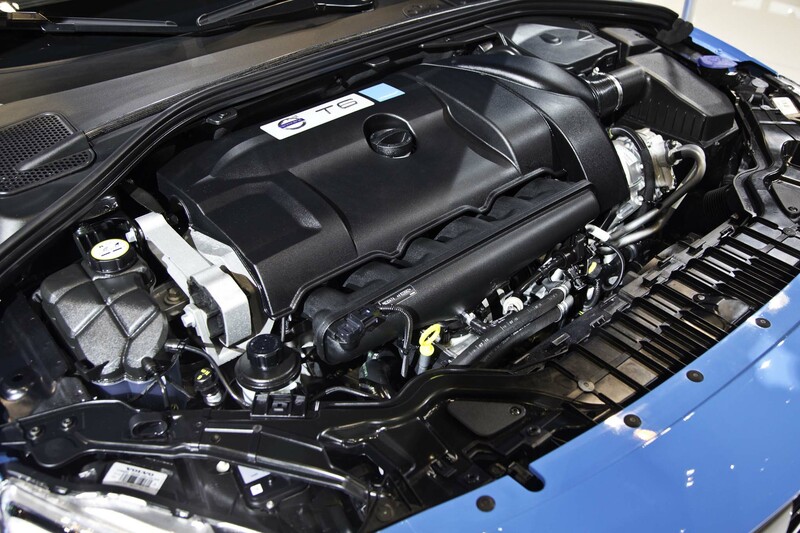 For the V60 Polestar, this reworked engine gets a bigger turbocharger, new connecting rods, new camshafts, a larger air intake and a higher-capacity fuel pump. These enhancements propel the V60 to 60 mph in 4.5 seconds. And this 4-cyl. jewel raises an important question: Are specific outputs of 200 hp per liter within grasp for mainstream engines? Volvo V60 Polestar display screen at startup. The winning automakers will be honored Jan. 11 at a WardsAuto ceremony in Detroit during the North American International Auto Show. Powertrains we hope to test next year in the 2018 competition include the Audi A3 e-Tron Sportback, Chevrolet Bolt, Honda CR-V 1.5L turbo-4, Hyundai Ioniq plug-in hybrid, Jaguar Land Rover 2.0L Ingenium gasoline turbo-4, Mazda CX-5 2.2L diesel 4-cyl. and Volkswagen e-Golf extended-range electric vehicle. Please visit WardsAuto.com in the coming weeks for additional commentaries, profiles of the winning engines, videos and more information about the 2017 Wards 10 Best Engines.